From Full Creation to Simple Installation, We Can Help! From Full Creation to Simple Installation – What’s the difference? The Pinnacle Custom Signs team is frequently contacted about different projects regarding business signage needs. We often write about “full creation projects” such as our recent job for Pinnacle Bank, “complete creation projects” such as our work for Cook Construction, or just simply “installation projects” with partnerships across the country such as our installation for Archer Signs and their client Smokey Bones. However, for those who aren’t in the sign industry, it may all seem the same. So what’s the difference? Pinnacle Custom Signs has a network of sign installers and national design companies within our networks from coast to coast. That is why we are often contacted by production companies to perform local installations for regional and national. 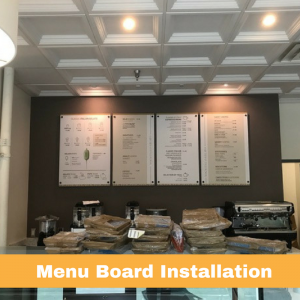 Often, the installation work we perform is specifically requested to be after hours or through the night when retail locations are closed and need to install new or updated branding. Although there are several national design and production companies we work with, we most recently completed a project for Innerworkings’ client Frye. Innerworkings is a full-scale marketing execution company that assist leading brands in executing marketing strategies through integrated, multi-scale marketing channels. Among those channels is the print and graphic design services for many of Fortune 500 companies. 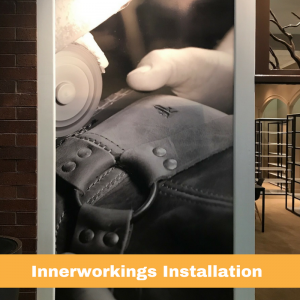 Innerworkings reached out to Pinnacle to install the new window graphics and signage for the local Frye store located at Cobb Galleria. 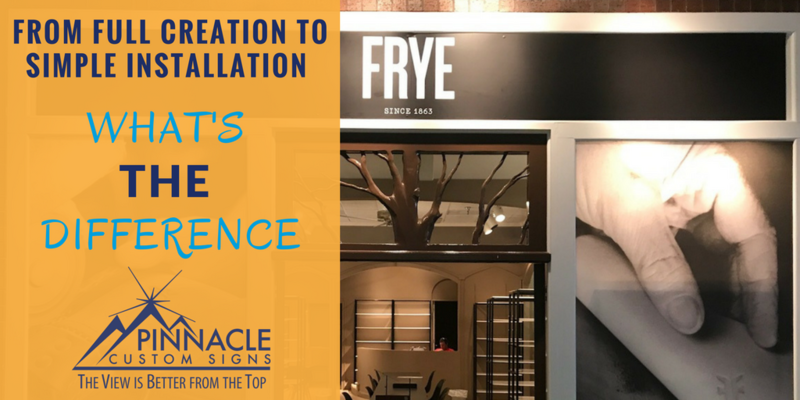 Although we did not design these graphics, we assisted in helping Innerworkings fulfill their agreement with Frye by completing their job for the Frye location. Clients also come to us with design standards and brand specifications in place. Occasionally, they have the designs for their signage created ahead of time and are looking for a company to complete the fabrication of the signage and then perform the installation. Pinnacle can perform these tasks as well. Regardless of scale or complexity of the signage, Pinnacle staff can assist our clients in figuring out the best methods of execution to complete their vision and standards. Many times, a client has a signature look or sign project that becomes the focal point of their design strategy. In these cases, our design and production team collaborates on both the best process for completing the project and the best material to ensure the longevity of the signage. Past clients, such as our recent work with Voga Italian Gelato, provide a great example of using various sign techniques to create a signature look for our clients. By combining various elements such as window and wall graphics, menu board creation and installation, and an outdoor blade sign, we created a comprehensive look that allowed us to convey their brand standards. Our experience and knowledge of multiple techniques allowed us to complete this project for the client. More often than not, it is our experience with various types of signage materials, mounting hardware, and design tools that allow us to provide a great fabrication experience of the design work provided by the client’s design company or in-house marketing department. Pinnacle has many clients who rely on us to provide a full suite of design and installation services for their signage and branding needs. Many of our clients do not have access to high-resolution vector copies of their logo. These clients may know they need signage but are not sure where to begin in the signage process. We offer support to businesses regardless of their challenges to help them achieve their signage needs. Pinnacle employs on-site designers who can help in the transformation of signage artwork. We have often taken an online, low-resolution image and transform it into a workable and usable file to start the signage and branding process for your business. By creating these vector files, we provide your business with logos that can be used in the future for signs, vehicle and wall graphics, as well as other print branding your business may need in the future. In addition to our design team, our project consultants work directly with businesses to do on-site consultations so that our clients can have the best understanding of outdoor and indoor signage options for their business. Each consultant at Pinnacle works with the business to gain a clear understanding of their goals, budget and the message that they hope to achieve with their signage. This allows the team to make the best recommendations for the client. Design production and installation take place by a team of experienced sign professionals to ensure your vision as a business is accomplished. By knowing the scope and needs that your company’s sign project requires, you have a much better expectation of the steps necessary to complete your company’s sign strategy. It’s important to know how your sign company of choice can help with various aspects of your project. For clients who simply need a sign company to provide an installation in a far-off location – many different installers can be recommended to complete the project. 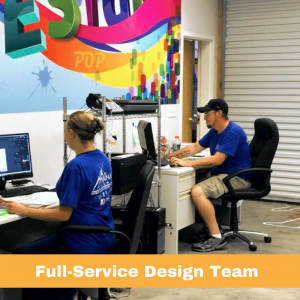 However, if you need more services, such as logo and signage design and creation, you need to find a full-service sign company that has a robust, experienced team to help you with all aspects of your project. As a business, understanding the steps of the process can help you to accurately budget and plan timelines to help fulfill your business goals. Our experience tells us that educating the client on the process is one of the key aspects of new business relationships with our company. Pinnacle Custom Signs is always willing to sit down with anyone needing sign services to provide a consultation about the scope of their needs. We can speak with you about the extent of your artwork requirements, provide your company proofs for approval, and educate you on the scope of the creation and installation process. Contact us today for any questions or to schedule an appointment. 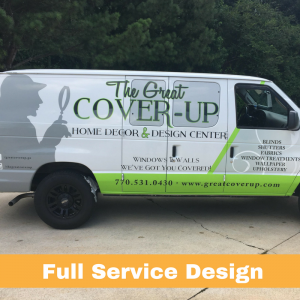 You are here: Home / Sign Services / From Full Creation to Simple Installation – What’s the difference?